The first thing I noticed on the menu was that Somos Peru pays homage to the strange mix of cultural influences that have made the food of Peru what it is today. 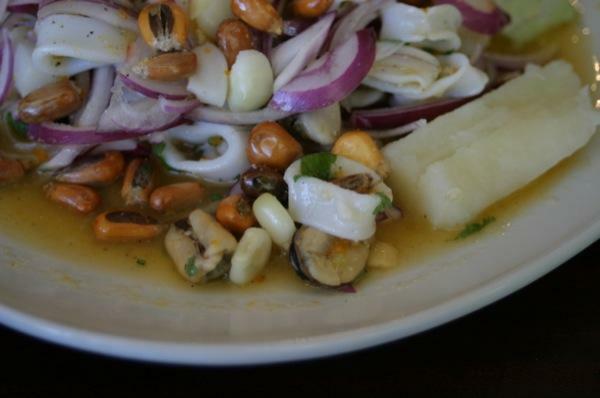 Due to a vast and diverse mix of immigrants, Peru's food reflects the food traditions of the major ethnic groups that make up the country, including Chinese, African, Japanese, Italian, and Spanish. And don't forget about the Indigenous Incan culture, as well. This mix of cultures and cuisines is almost too much to imagine, but it does help to explain the variety of dishes that show up on the menu, from Chaufa (a Peruvian fried rice dish) to the Tallarin Saltado (a stir fry with spaghetti) to the indigenous yucca and plantains used throughout the menu. And don't even ask me to try to figure out the origins of the popular street food dish called Salchi papas, a mix of hot dogs, french fries, mayo, mustard and ketchup. This menu will certainly keep you guessing. So, we found ourselves on yet another Latin eating adventure, trying to discern what you, our kind readers, might like to know about. As you know if you have read our intro article about why we are doing this, we have often based our eating on tacos and tamales. Well, obviously we were going to have to improvise at Somos Peru, and we love to improvise. The problem with a menu that is almost totally new to us is that we have to try and get a good overall impression off of just three or four items. Of course, we would ask our server for their opinion, but after that we would have to make a gut decision…good thing we were hungry. For lunch at Somos Peru, you have a basic menu with a few cheaper options than on the dinner menu, but of course, with a bit smaller servings (or so we were told -- the fried rice dish was still huge). However, you also have the freedom to order off of the dinner menu, making things endlessly more complicated. Of all the dishes they offer, the server recommended the Cebiche (not a typo…just slightly different spelling from the more typical Ceviche). It sounded good to us. 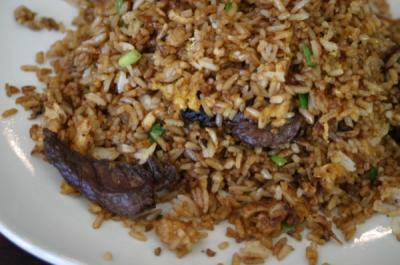 We also were extremely curious about this Peruvian fried rice mentioned above, the Chaufa de Carne. 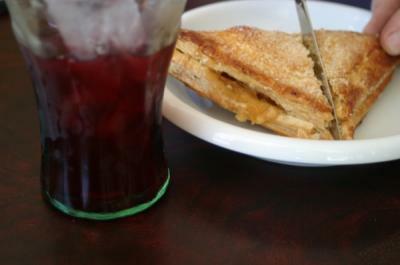 We added the Yuca a la Huacaina and the mysterious Chicha Morada or "purple corn drink." Looking around, the place was extremely spacious and clean and boasted a soon to be opened "sports bar," which you would assume means soccer, but there was evidence of some NFL interest. It seems that they are waiting for a liquor license of some sort. Either way, it would be an unique twist to an already fascinating place. The tv's currently boast a Peruvian channel complete with local news and talk shows. This place was full of surprises, like this purple corn drink we were talking about. With each sip, we were in wonder. The server described it as a sort of sweet iced tea. I could see that perspective, but it was really much more than that. To me, I got tastes of hibiscus, corn, sugar, and spice. The spice was subtle cinnamon, clove and mace, sort of like horchata. It was mystifying and pretty refreshing. It was definitely sweet. I'd say, try it. 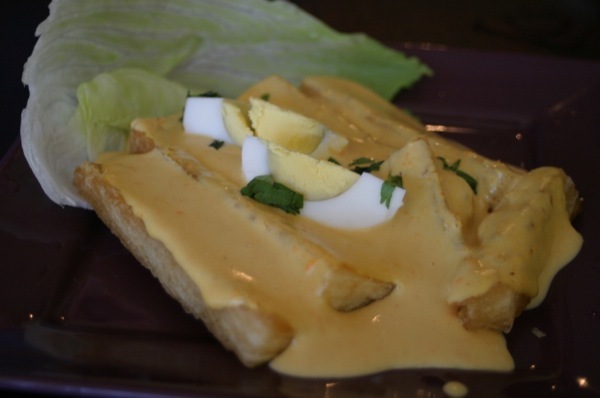 The Yuca came out as an appetizer and was covered in the traditional Peruvian yellow pepper/cheese sauce that is on many of the dishes including the Aji de Gallina. It would be unfair to compare the sauce to the processed, melty American cheeses we have in this country, but it is closer than anything else I know of…and the comparison is somewhat accurate. To me, yuca is almost always good and this was delicious while it was hot. Of couse, I am somewhat of a purist and when I go back to Somos Peru, I will definitely order yuca, but I will order it from the menu of sides. Plain old fried yuca is still my favorite. The main dishes came out and they both had a great appeal. Not only did they appeal to my senses, they were plated well on nice, real dishes. Perhaps most interesting, was the difference in what we were looking at. On one hand, we had the sour and sea-salty cebiche, complete with mussels, shrimp, calamari, and two large New Zealand mussels. It was quite the sight. On the other hand, we had a huge pile of rich, dark, and savory fried rice with some really nice looking pieces of soy-salty beef. See what I mean: cold, fresh, sour, and of the sea, compared with hot, fried, savory, and of the field. The Cebiche was really well done. It was a massive amount of seafood, with plenty of red onions that somehow were not overwhelming. Perhaps it had something to do with the sauce, a wonderful blend of lime, salt, tons of black pepper and fresh yellow pepper. 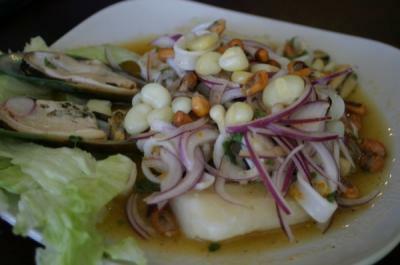 The Peruvian version of this dish is also served with fresh hominy, fried and crispy hominy (cancha) and boiled cassava. The more we ate of this, the more we appreciated it, to the point that when it was gone, we were still tasting the broth and searching for more bits of calamari. The Chaufa de carne was really just fried rice. It was amazing that you could have been served the same thing in a Chinese restaurant. Of course, it was really well done fried rice in my opinion, meaning that it was given a good treatment in the wok or on the grill and the soy sauce was prevalent and balanced with a good amount of sweetness. The meat seemed full of sweet and soy and was tender and delicious. It was simple, but satisfying. We had an empanada for dessert, but as compared to some we've had in the past, these were a major disappointment. Often, they are fresh from the fryer, brimming with sweet dulce de leche or fruit. This one tasted like something you would grab from a bakery case and perhaps like it wasn't quite fresh. We wish that we would have ordered the Crema Volteada, a Peruvian version of flan. Next time. Perhaps the best moment of the whole visit to Somos Peru was when we were leaving. We noticed a gentleman (who turned out to be the owner) feasting on a dish that we didn't see on the menu. It turned out to be a really large piece of chicharron, or pork belly, deep fried. It looked amazing. Next to it were fried yams and a nice piece of homemade bread. We asked him about this and he said it is only served on the weekends. I am still not sure if it is on the regular menu or served as a special, but it doesn't matter. I'm bold…I will ask for it and ask for it soon. It really looked amazing. So, in closing, we always like to tell you what we would go back for the next time. It would be hard to resist that Cebiche, and it is definitely worth the $14 price and would go nicely with a side of fried yuca. I've been putting off trying one of the most famous dishes of Peru, the Loma Saltado (a dish of grilled beef strips, onions, pepper, tomatoes and french fries all mixed up) and this might be the place to try it out. Of course, the chicharron is on my list, in any form it shows up on the menu and obviously, I will finish my next Somos meal with the aforementioned flan. Its a good sign that I'm getting hungry just writing this review. See you soon Somos Peru…and thanks! Surprise: lots of them, including: A membership program with special deals, happy hours, nice plates and linens. The menu and sign call this place a sports bar?? Finally, this might be the first time that we have been to a place without a tortilla on the menu....interesting. Language: our server was extremely bilingual. It was impressive. The owner was also impressively bilingual. Easy menu to read and follow. Lawrence Black is a writer and editor at Simple, Good and Tasty. He can be reached at lawrence@simplegoodandtasty.com. Beware of his crazy eyes as they search for the next great Latin eatery as well as his almost constant onion breath. Peee-ew. 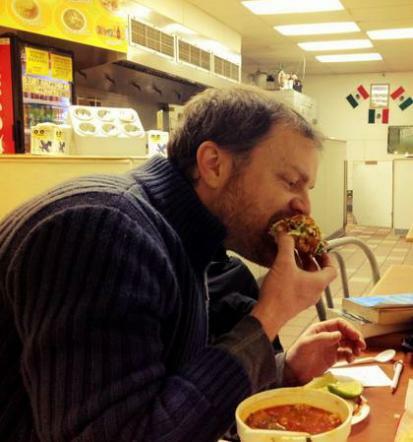 Our last Latin Tongue review was: Nachos Supermercado.